There are over 500 million domestic cats in the world, yet there are a few things as surprising as the number of myths surrounding cats. 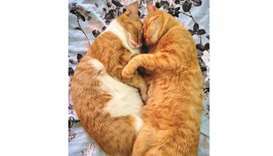 Often seen as disloyal, recluse and passive aggressive creatures, the number of myths about the way cats behave and survive is a little startling, given that cats and humans have been associated for nearly 10,000 years. In fact, some historians believe that cats have been around since 3600 BC, 2,000 years before Egypt’s pharaohs. The point is not that cats are antique creatures, but that they have mingled with the human kind for many centuries, co-existing in love and peace. Perhaps the most common of these myths, and arguably a favourite of those who harbour a secret disliking of the feline pets, is that cats are not loyal. But anyone who has housed a cat even for a month would tell you that such logic holds no truth at all. Cats recognise human voice, especially that of their owner. They jump into our laps, climb on top of laptops and even our heads when they feel like it, which is typically either when they want to sleep or seek cuddle or two. They know when we address them, but usually they act too cool to care for our instructions. But that’s the thing. Cats love humans in their own furry little mysterious ways. The question is: is it okay for us to label an animal disloyal just because they are hard to train and not the kind to be at our beck and call?